Six activists have been beaten and arrested for distributing leaflets calling on the West Papuan population to boycott the upcoming elections on Wednesday 9th of July. The police are specifically targeting any groups who call and protest for a boycott, as well as a referendum of the presidential elections. There will be a major police and military presence during the elections and the local population has been “advised” to report any disturbances. 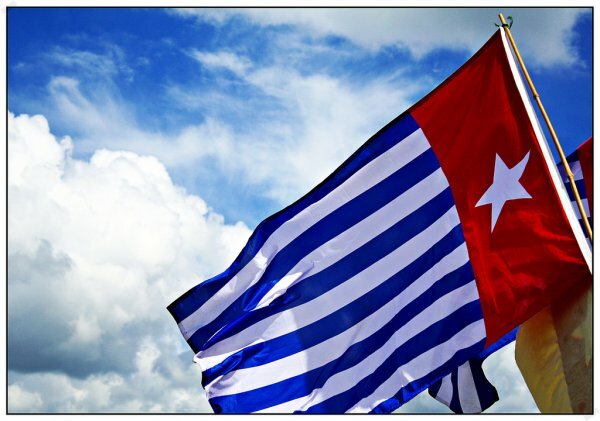 The National Committee for West Papua (KNPB) has reported that a six of their activists were arrested, beaten and taken to the Jayapura Police Station on Thursday afternoon. The six activists are Ono Balingga, Hakul Kobak, Yandri Heselo, Gesman Tabuni, Ronal Wenda. The name of the sixth activist is not known at this stage. They were arrested simply because they were distributing leaflets calling on the West Papuan people to boycott the presidential election, which is to be held on July 9. Local media has reported that in Timika the Police were also searching for people who distributed leaflets urging voters to boycott the July 9 presidential election and demanding a referendum. “A group led by Teni Kwalik is behind it because he made a statement calling for the boycott of the presidential election,” Mimika Police Deputy Chief Commissioner Wirasto Adi Nugroho said on Tuesday in Timika, and “we have advised the local people to report to the police when they have any information, so we can arrest the perpetrators”. He went on to say that police had erased the graffiti and destroyed the leaflets to avoid public unrest. Nugroho said the situation of Mimika Regency is relatively still favorable. Joe Collins of AWPA (Sydney) said, “the security forces appear to be targeting any civil society groups who are calling for a boycott of the presidential election and are deploying over 300 police and soldiers for security during the election”. The Puncak Jaya Police chief, adjunct commissioner major (Pol) Marselis Sarimin, said “Yes, they have been called up to secure the presidential election from any disruption by certain groups that exist in Puncak Jaya region and other regions.” The Papua police chief, General Inspector, Tito Karnavian is also reported to have said that the security forces have shifted a number of troops to the areas that are considered vulnerable to security disturbances.